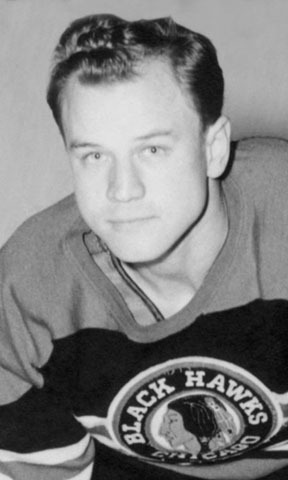 This 1965 NHL Hockey Hall of Fame inductee played with Providence in 1940, hitting the nets for 14 goals and 33 points in 36 games for the Reds. He holds the great distinction of having scored the fastest “hat trick” in NHL history - notching 3 goals for the Chicago Blackhawks against the NY Rangers in just 21 seconds on March 23, 1952. Mosienko won the Lady Byng Memorial Trophy in 1944 as the NHL’s most gentlemanly player and played in 5 league All-Star games. The high-scoring winger tallied 258 goals and 540 points during his illustrious 711-game career, spanning 1941 through 1955. Upon his retirement from the NHL, he helped to create the Winnipeg Warriors of the Western Hockey League, with whom he played for 4 seasons. He was later inducted into the Manitoba Hockey Hall of Fame in 1980.